Channel Manager's Front Office system gives access to the full Hotel Management system, which includes the ability to create guest room bookings, run a daily book which shows all rooms in the establishment at a glance, check in and out guests and transfer guest invoices to the debtors file. Channel Manager correlates and reports everything the Hotelier requires including bank reconciliation reports, room cleaning, daily guests list, debtors list, forward bookings reports and source of business reporting which lets you know where your business is being generated from even social media sites. 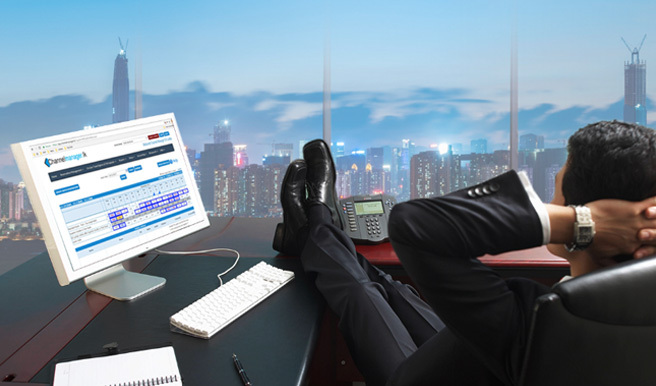 Channel Managers's Front Office System module lets the hotel owner have the full front office system, which includes the ability to create guests room bookings, run a daily book which show all rooms in the establishment at a glance, check in and check out guests, transfer guests invoice to the debtors file. Channel Manager produces a source of business report, supplies the manager a daily bank reconciliation report for the daily banking and has a daily guests list which shows all guests on a daily basis. The Front Office Module lets the hotel manager put in the number of guests, arrival date, departure date, number of rooms required, first name, surname, address, post code, email address, number of adults, no of children, cots, car registration and comments. The module also allows the hotel manager to enter in mode of payment: cash or credit card and in addition the charges can be put into a debtors file and can be sent at the end of the month to streamline your accounts. You can select the source of business that the booking came from, which lets the manager know where all their business is coming from. There is a set of tables for the guest's charges and these tables can easily be changed to suite each different type of hotel/motel etc. Every day Channel Manager produces a daily guests list, which shows the guests who have to check in, guests who have checked out for that day, lists the guests that are arriving on that day.